It is a supplement with proven effect, which increases the product of testosterone - the most anabolic hormone that occurs in your body. Reach for faster growth and greater strength. If you have not yet tried this - you do not know what you're missing! It is a product derived from the Dorian, the composition of which is fully thought out and functional. Support your body in the fight for the dream figure. One of the most important parts of this is regeneration, which will provide intensification of just GH Blast! Dorian Yates GH Blast is a sensational formula of nutrients for the night! GH Blast is a supplement that provides a deep regenerative sleep - supports the production of growth hormone during sleep and regenerate muscles. The preparation by advanced formula, not only regulates sleep, but also prepares the body for the next exercise - helps to achieve faster deep phase of sleep, so you wake up refreshed, with more energy, and your muscles are ready for the next workout. 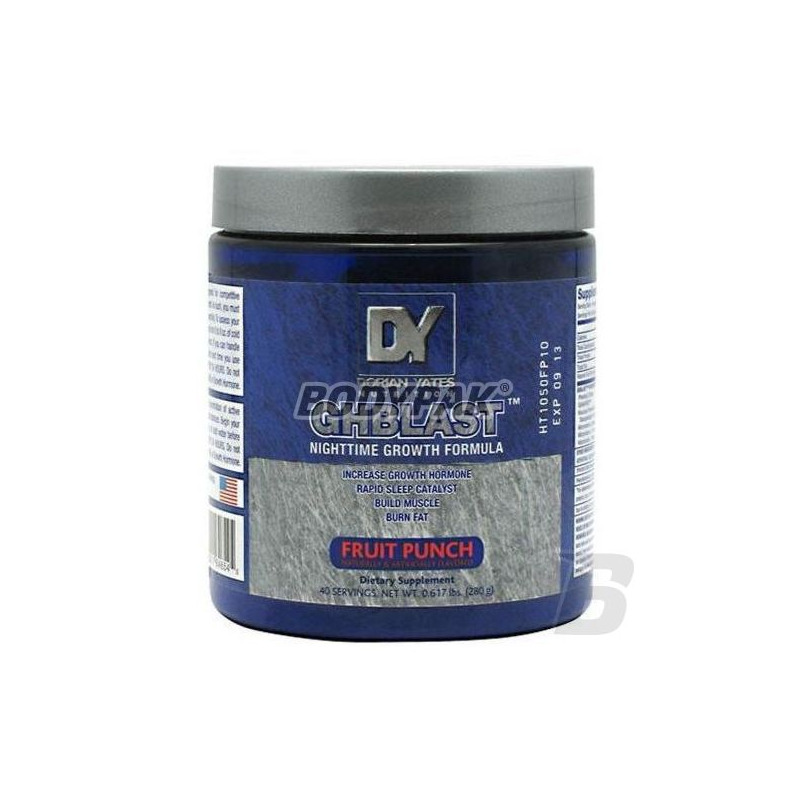 The ideal supplement for the night for any athlete - GH Blast the legendary Dorian Yates. Superb conditioner anabolic night GH Blast by Dorian Yates Nutrition perfectly regenerates tired body after a workout in preparation for the next exercise. GH Blast runs anabolic - increasing growth hormone levels during sleep and supports the building of muscle tissue. In addition, Dorian Yates used in smaller doses throughout the day improves mood and well-being. GH Blast is the perfect supplement for hard training athletes. Dorian Yates GH Blast is a unique conditioner for sleep. Thanks to the active ingredients provides a deep relaxing sleep, allowing for a complete rest, even after the most intensive training. Blast GH has Mucuna pruriens extract, which has the ability to increase testosterone and stimulate growth hormone. Action GH Blast affects not only for building muscle, but also improves libido and sexual function. Increased energy, well-rested body, bigger muscles and libido - it's all thanks to the nutrient sleep Dorian Yates GH Blast. Other Ingredients: maltodextrin, malic acid, citric acid, natural and artificial flavors, aspartame, acesulfame potassium. IHS Omega 3 - 90 kaps. IHS Omega-3 - prevents cardiovascular disease, lowers triglyceride levels and supports the work of the nervous system. In the preparation of Omega-3 essential polyunsaturated fatty acids omega-3 are involved in many important body processes and are a valuable source of energy. A unique combination of herbal extracts of natural origin, vitamins and l-carnitine! Excellent formulation supporting normal work and liver health. It supports regeneration, cleansing and general functioning.